lies access to some of the most spectacular underwater caves on the planet. Divers travel from every continent to hang suspended in water as clear as air and gaze upon decorations pre-dating the ice age. For many, the splendor of the Yucatan cave experience is beyond words. 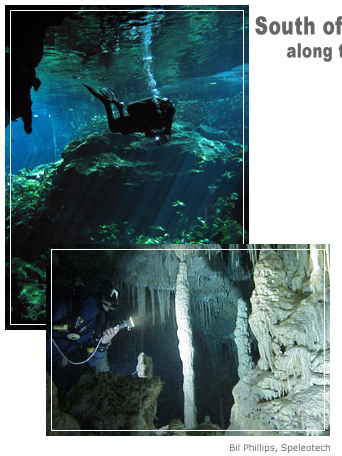 Of course, it is no surprise to most people that cave diving requires specialized preparation and training. When selecting an instructor or guide, there is absolutely no substitute for the track record and experience of an established, reputable underwater cave explorer. Bil Phillips is one of a small group of highly experienced and still very active explorers in the Yucatan. He is personally responsible for the discovery of many of the popular underwater passages currently visited by cave divers, and continues to add to the list. He has also delivered first-rate training in the region since 1995. Since 1999, he has provided training, guiding, and exploration and research services through his company, SPELEOTECH.